We are excited to introduce a new feature to our product line up, the Mobile Photo Album App! This app is included in the Premium Package and the Lovely Luxury Baby Plan Package. The app can also be purchased a la carte as an addition to any Essential, Deluxe, or Baby Plan Package. 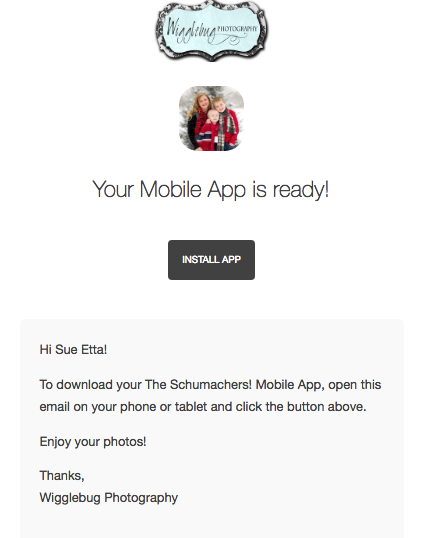 When your gallery of photos is ready, you will receive an email with a download link. When you click on this link you will be able to download your very own personal app with all the photos from your session. Gone are the days of wallet size photos because everyone has a phone in their pocket. Now you can use your mobile phone to show off your gorgeous new photos of your family and little ones. Would you like to see a sample? CLICK HERE to download an sample of this app featuring the Original Wigglebugs. (Please note, this must be done on a phone or mobile device, it can not be done on a computer).